A group of seven nursing students in their second year at London South Bank University's (LSBU) School of Health and Social Care have just won first prize in a competition to design an 'End of Life' themed poster that could be displayed inside hospitals, providing advice and guidance to terminally ill patients, their families and carers. The competition took place at the Nursing, Midwifery and Allied Health Professionals conference at Queen's Hospital, Romford. Competing poster entries were placed on display during the conference for delegates to view and vote for their favourite design. The winning poster featured a rose illustration, fashioned out of coloured tissue paper, with snippets of information about end of life care inscribed under each of the fallen petals. The Trust plans to integrate this poster design into their end of life information and teaching. The poster was selected to demonstrate an 'It's Time to Talk” message relating to end of life care while supporting ‘Dying Matters’ awareness week, an annual event run by a coalition of medical charities to raise awareness of best practice in palliative, end of life care. A second group of nine LSBU nursing students was picked by clinical staff from Barking Havering and Redbridge Trust (BHRUT) to present their posters in the foyer of Queen's Hospital and talk to the public and hospitals about end of life care. Jane Crussell, Senior Lecturer in Adult Nursing and End of Life Module leader at LSBU’s School of Health and Social Care said: “We are so proud of our students for participating in these events. 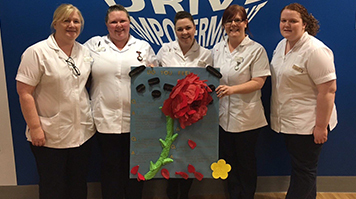 It’s really impressive that our LSBU undergraduates won this competition by being able to demonstrate their creativity and commitment to providing support to staff caring for families at the end of life. Our students also managed to fend off competition from more seasoned postgraduate students on the day. The participating students will continue to build on this work as part of the Art of Nursing project funded by Centre for Research Informed Teaching (CRIT) led by Dr Calvin Moorley and a team of academics in the Adult Nursing & Midwifery Division at LSBU.